Cenozoic Volcanic History of the Western U.S. 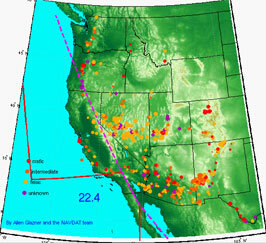 Integrating Research and Education > EarthChem > Cenozoic Volcanic History of the Western U.S. In this activity, students view a Quicktime video animation based on data from the North American Volcanic and Intrusive Rock Database (NAVDAT) to learn about the history of volcanism in the western U.S. during the last 65 million years. Students are guided through the complex data-rich animation with a series of instructions and study questions which highlight time-space-composition relationships and link to plate tectonics. This exercise is one of several examples featured in the Geoscience Education in the New Cyberinfrastructure module at SERC. Each example is designed to give instructors and students direct practice for using cyberinformatic databases and tools to analyze Earth science data. Students should begin on the Getting Started page.